This cake was a nice little blast to the past. One of my dorkiest phases was back when I was a huge Buffy/Angel fan (the shows still rock, but after being off the air for 6-7 years I'm a little less enthusiastic). Not only did I love the shows, but I was somewhat obsessed with collecting related merchandise. The area I spent most of my attention towards was the action figure line. Part of that included being involved in an online community of collectors. Soon some of us began customizing them with different paint jobs, or sculpting episode specific clothes or hair. "Customs" began to get really popular online and I jumped in and even sold a few of mine. 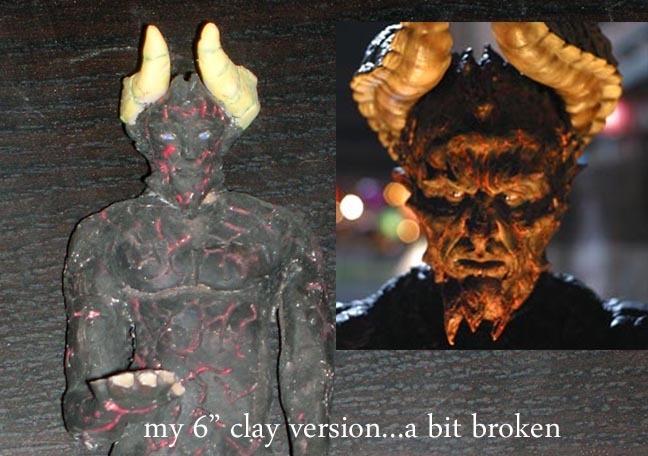 The first figure I sculpted pretty much in its entirety was a character from Angel called The Beast (pictured below), and I must've been around 15-16 at the time. After brainstorming about new cake challenges to tackle, I thought why not go back to my roots and have another go, this time in food form. 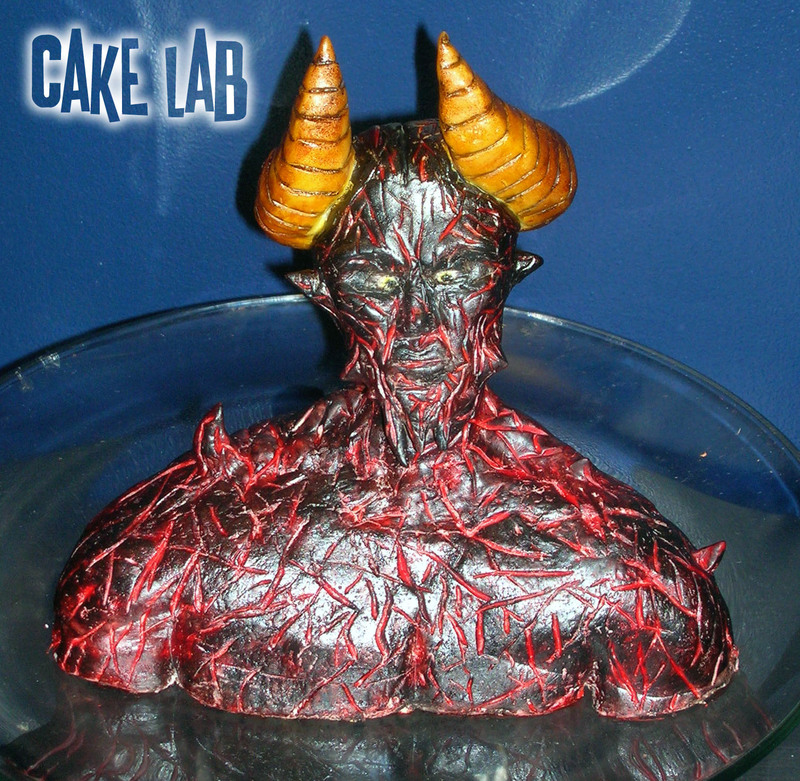 After some planning I realized there was no way I could do this cake the way I wanted with fondant and gum paste. The detail wouldn't be fine and there would be seams everywhere. I wondered if I should try modeling chocolate. I had seen many cake decorators use it on TV before but I didn't know much about it. After a little bit of research it turns out you can easily make it by melting some chocolate and adding corn syrup. Awesome! Before I started I figured the face would be the most challenging aspect as I haven't done much sculpting, and what I have done has been small cartoony animal figures. The head actually went really smoothly (head and horns made of rice krispie treats covered in modeling chocolate), and the body seemed to go pretty well too, but as I was getting ready to paint I noticed things were going downhill fast! The cake I used was very soft and began sinking under the modeling chocolate. Instead of having the shape I carved it began to look flat. The stick anchoring the head began to poke through the top of the head. My cool cake was turning into a disaster! I decided to bake another cake, this time I wanted to get rid of some old ingredients so used a book recipe that included them. Big mistake. That cake was worse than the orignal. I didn't know what to do...so much work and it was just a mess. 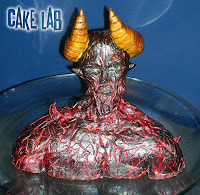 Then I though about cutting some of the cake out of the body and replacing it with rice krispie treats, that way the shoulders and neck would have some support. Thankfully it worked and gave me a decently shaped end product. The body isn't exactly as I'd pictured but it was the best I was gonna get without starting all over again. Painting wasn't too difficult, just painted the thing red then black, and the red stayed in the lines I carved. Horns didn't turn out quite as I'd like...I first airbrushed them yellow then brown which looked awesome, but I then began to paint in the black likes but it wasn't turning out the way I wanted. I whiped off the black with a wet paper towel so that the black would just be in the indent, but it also ruined the airbrushing job. I went over with the airbrush again but since the canvas was a little blotchy I didn't get quite the result I was looking for. 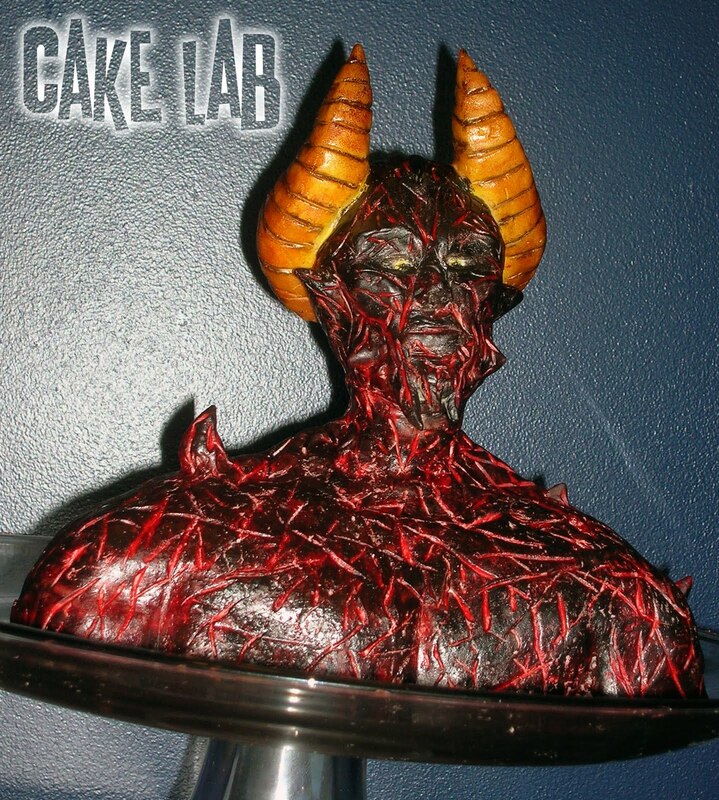 Probably the biggest disappointment in the cake is that it's really hard to see the detail in the face since it is black. 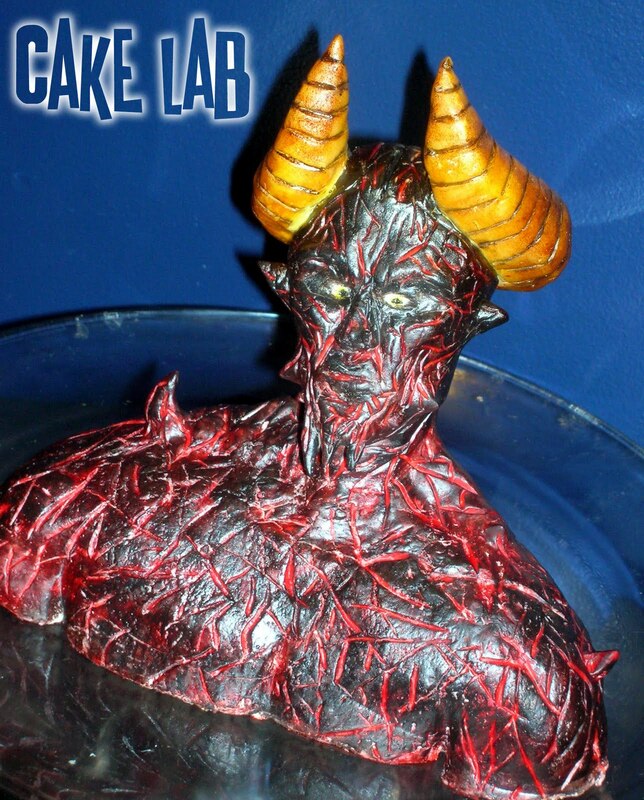 If I can find the time I may make another demon cake but this time choose one with a lighter skin tone. So that is it for this cake! Another challenge completed and another addition for my portfoilo. Perfect time of year for this cake too. I think this look pretty awesome and if you didn't mention about your problems you had with the cake, i won't have known. Looks like a flawless piece. I too have been thinking of attempting a cake like this but i'm still worried about the cake structure. On my journey to become one of the best decorators in the world. Just you wait!